CHELSEA — A circular garden filled with trees and plants is coming to the newest section of the High Line. 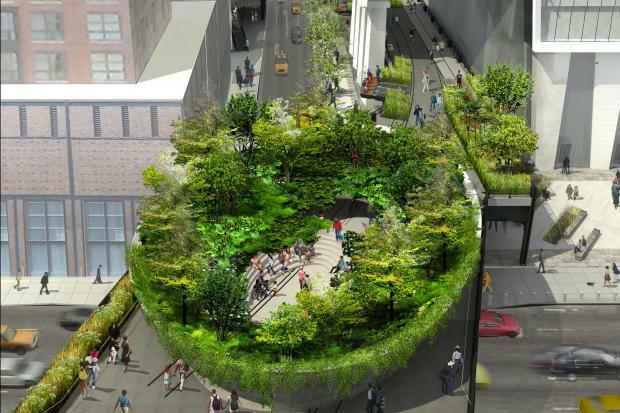 New designs for the much-anticipated third section of the elevated park feature a large, bowl-shaped space covered in greenery on the Spur, a section of the High Line sticking out over West 30th Street and 10th Avenue. The Spur will include seating for visitors, and it will surround them with woodland grasses, perennials and ferns, along with Snakebark maple and black tupelo trees, according to renderings by James Corner Field Operations and Diller Scofidio + Renfro. "In contrast to the surrounding urban development, the bowl structure provides a lush and otherworldly environment inspired by the dense layers of a woodland habitat, immersing visitors in nature," the Friends of the High Line wrote on their website. The Spur is part of a third and final section of the High Line that loops around the West Side Rail Yards — soon to be the Hudson Yards development. The Friends of the High Line hope to open that section by late 2014, though the tree-covered Spur will likely take another year or two to complete, the group said. The entire High Line at the Rail Yards project is expected to cost $76 million, officials said.